This is a talk from Jack Conte, the struggling musician who figured out how not to struggle – and then created Patreon. Music is one of the toughest businesses in the world, but at the end of the day, it’s like every other business and every other business is like the music business. The goal: Find fans who will give you money. In a little less than 11 minutes, Jack cuts through all the smoke and reveals the most important thing you must do to get on the road, stay on the road and get where you’re going regardless of the business you’re in or where you’re starting from. It inspired me. Maybe it will inspire you. P.S. 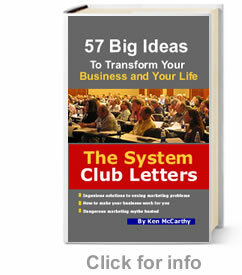 If you like ideas like these, check out The System Club Letters: 57 Big Ideas to Transform Your Business and Life.